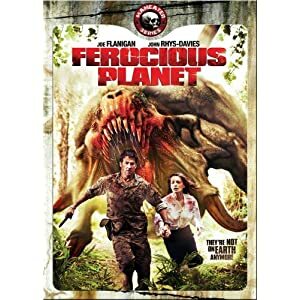 This is a film made for the cable television channel SyFy which is probably as much information as you need to judge how good this film is. Synopsis: A group of people are gathered in an underground laboratory in a Federal building, including scientists, military and politicians, to see a presentation of an experiment into viewing other dimensions. Just as you’d expect from such predictable piece of hokum there is an accident and instead of just viewing another dimension it rips the whole lab out of our dimension and dumps it into a parallel dimension populated only by plants and giant carnivorous CGI monsters. The survivors must find a way to repair the machine that brought them here and escape the ferocious creatures. Overall this was very a mediocre and lazy film. I can’t fault any of the actors too much since they were competent enough with what they had to work with. Joe Flanigan plays his standard wise-cracking soldier hero part. John Rhys-Davies is the cynical arrogant Senator. Dagmar Döring plays the scientist in charge of the project.